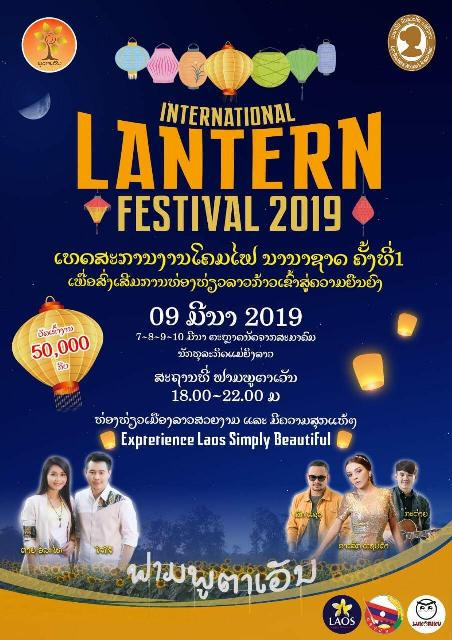 (KPL) The first International Lantern Festival will be held at agro-tourism Phoutaven Farm in Pak Ngum district, Vientiane Capital on Mar 7-10. “The International Lantern Festival 2019 aims to promote tourism in Vientiane Capital and Borikhamxay Province as well as Visit Laos-China Year 2019,” said the Director of the Borikhamxay Provincial Department of Information, Culture and Tourism, Mr Khein Lormany. He said the International Lantern Festival 2019 was among efforts to attract more visitors, both domestic and foreign, to Borikhamxay Province. The festival will feature 50 booths representing six countries in ASEAN, according to the Vice President of the National Chamber of Commerce and Industry Ms Chanthachone Vongxay. The festival will also feature a concert by well-known singers from Laos and Thailand and a trade fair of local products and those from Vietnam, China, Japan, and Thailand.